Learn How to Keep Fleas at Bay - Yes Pest Pros, Inc. Learn How to Keep Fleas at Bay - Yes Pest Pros, Inc.
Fleas are often associated with animals – specially household pets – and for good reason. Fleas living outdoor are always on the search for a warm body to latch onto and get a meal from. Dogs and cats that run around outside can make for easy targets for fleas, especially during peak seasons. Sometimes fleas may even be brought into your yard from other animals such as mice, rabbits, opossums, and more. Once they jump onto a household pet, that’s where they’re going to want to stay for as long as possible. Fleas are very tiny and can be extremely difficult to find on pets or in homes. Yet despite this tiny size, they have a staggering ability to jump huge distances. This is what makes attempting to catch them almost impossible. Even if you manage to pinch one between your fingers, there are undoubtedly going to be more. The only way to really rid your pets of fleas is to give them a thorough bath complete with flea killing shampoo. However, if a flea problem isn’t nipped in the bud, it can quickly become out of control to the point that fleas will live in carpeting and start using humans as their food source. 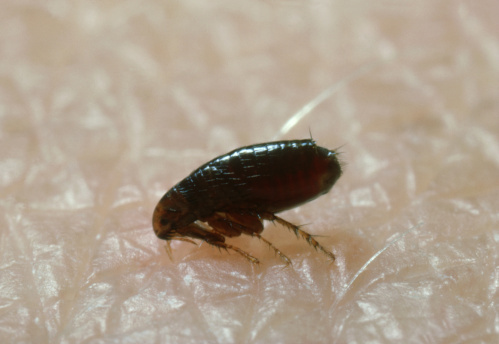 This means you and your family can end up with flea bites from sitting on the couch or even sleeping in bed. Even if you wash your pet, if fleas have already grown in population and left the animal, they will simply jump right back on. Fleas can transform into one huge annoying problem. What’s more, you do not want fleas biting you or your pet because they can transmit diseases. In fact, it was not rats but fleas doing the transmitting of the Black Plague centuries ago. If you suspect that you have a serious flea problem then you need to contact pest control professionals and have it taken care of. They have various methods that they can use to help rid your home of fleas. You can also ask what their green products are if you want to be more eco-friendly as well as good to your family and pets. Once they finish their work, don’t forget to give your pet a good cleaning! It might help to take them to a vet and not only give them a thorough bathing, but also invest in some flea repellant medicine. That way fleas won’t be following them into the house again.